The Farmington wrestling team poses after capturing the Class 3, District 1 championship on Saturday at Black Knight Fieldhouse. Nine members of the Knights' roster qualified for the upcoming state meet. 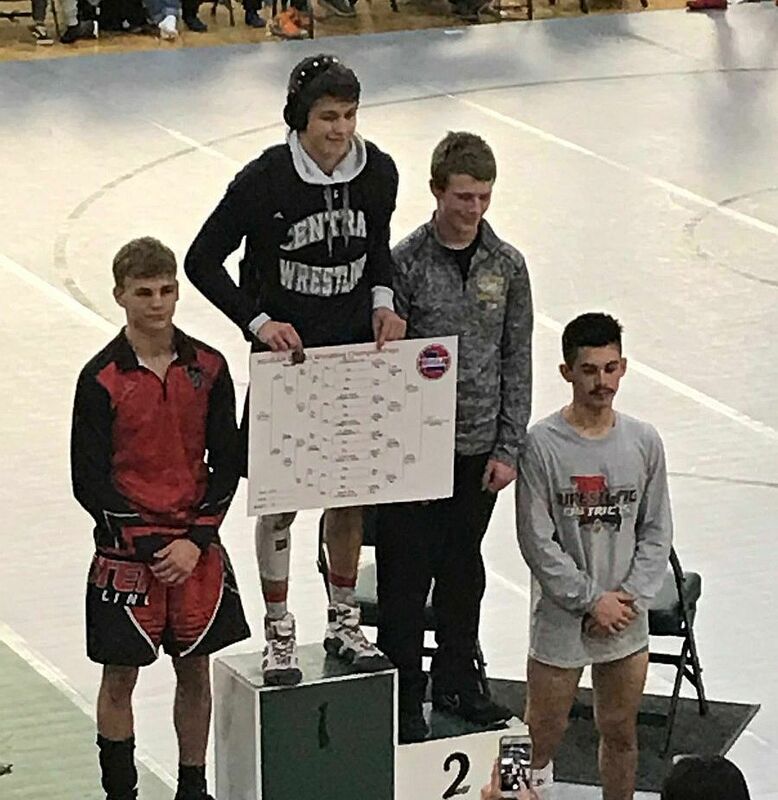 Central sophomore Kade Willis stands atop the awards podium after winning the 126-pound bracket at the Class 2, District 1 tournament in Ste. Genevieve on Saturday. Willis takes a 39-0 record into state competition. FARMINGTON – Dalton Berg spent the final seconds of the third period on Saturday bouncing around to avoid Sikeston opponent Tyreke Jamison along the edge of the circle while poised to erupt in celebration. Berg was not only competing for an individual district wrestling title at 220 pounds, but also had the overall fate of the Farmington team hinging on his performance. After blocking a lunging shot from Jamison, Berg grasped his left ankle and swept the other leg from behind to earn the go-ahead takedown with less than a minute remaining. His eventual 4-3 decision afforded the Knights three massive points, and propelled them past Pacific by a 162 ½-161 margin for the Class 3, District 1 championship. Austin Wadlow dominated at 113 pounds, and equaled Berg atop the awards podium. They were two of nine Farmington wrestlers in all to qualify for the upcoming state meet. Judd Cunningham (195) faced similar pressure minutes before Berg stepped to the mat, and delivered a 5-2 victory over Chase Greenlee of De Soto for third place in his division. Those points padded the Farmington total, and created separation from the Dragons, who were directly in contention before finishing third with 159 in a balanced field. Berg (35-4) recorded a first-period fall and 13-0 major decision earlier in the tournament. Wadlow (32-6) topped Dezmond McSellers of Rockwood Summit in their title bout. Smokey Branch (145) turned in a runner-up effort for Farmington after advancing with two falls and a 3-1 decision. He was pinned at the 1:48 mark of the final. Cunningham earned the first takedown of his third-place bout after Greenlee was penalized for an illegal clasp early on, and stayed vertical following a third-period escape to protect the win. Kyle Crawford (120) registered four falls in five matches, and Dayton Boyd (106) pinned his third foe of the event to give Farmington two more third-place showings. Blake Cook (126), Drew Felker (132) and Kael Krause (170) each extended their seasons by taking fourth. State competition for boys and girls begins with opening-round action on Thursday in Columbia, Mo. North County finished seventh in the team standings with Cody White (106) and Jonathon Coroama (120) qualifying for state. White earned a fall over Dillon French of Festus in 1:46 to punctuate his title after opening with a first-period triumph and notching a subsequent 23-12 major decision. Coroama improved his team-leading record to 37-6 by pinning Crawford, then dropped an 11-0 major to wind up second for the Raiders. STE. GENEVIEVE – Dexter edged tournament host Ste. Genevieve 187-183 ½ to bring home the Class 3, District 1 championship, but not before nine Dragons advanced to the state meet. Dalton McNeal (113), Jacob Dickens (132), Grant Staffen (145) and Noah Ogden (152) shined in their respective brackets as individual title holders for Ste. Genevieve. Central sophomore Kade Willis capped a perfect regular reason at 39-0 by coasting at 126 pounds. The Rebels ended up fifth in the team standings. Dickens bolstered his record to 39-8 with a 3-0 decision over Dalton Thompson of St. Clair in the final, and beat Potosi standout Noah Juliette 11-2 earlier in the action. Staffen was also dominant for the Dragons. The senior landed an 11-3 major over Kobie Blankenship of Sullivan after earning an early fall and 24-9 technical fall. Odgen pinned two opponents to headline his bracket. McNeal did likewise, and punctuated his weekend when Josh Countryman of Central defaulted after two periods due to injury. Gavin Gross eclipsed 30 wins by taking second at 106 pounds for Ste. Genevieve. He needed only 57 seconds to advance past the semifinal round. Only three wrestlers were enrolled at 220 pounds, and senior Isaac Boyd continued his comeback from injury with a runner-up result. Boyd finished second in the state at heavyweight last year. Ty Brown (195) amassed his third fall of the event against Potosi senior Kalub Evans for third place, and Clayton Vaughn (285) put three competitors away in the second period. Vaughn suffered his lone setback against Aaron Herman (40-1) of St. Clair. Nathan Selby survived with a fourth-place finish for Ste. Genevieve. Willis looks to elevate his state medal position next week after securing fifth as a freshman. He received two byes as the top seed, pinned Selby and downed Sullivan’s Ty Shetley 16-1 on Saturday. He is among five state qualifiers who will represent Central. Garrett Smith (120) equaled Countryman by taking second after posting back-to-back falls. Joshua Whaley (182) won his third-place bout 7-2, and Blake Bolin avoided elimination from the 145-pound ranks with a 3-1 sudden victory in the late consolation round before losing 6-0. An injury prevented Juliette from competing for a state berth, leaving senior Austin Harris (152) and Evans (195) as the two wrestlers moving forward for Potosi. Harris reached the 40-win plateau with a 13-0 major decision for third place. His previous contest also concluded in a positive shutout at 6-0. ST. LOUIS – Whitfield remained a dominant powerhouse in Class 1, District 1, while two of three entries from Valle Catholic kept their respective seasons going. Trey Huck (160) was awarded two byes in his bracket, and won by fall at 1:22 before being pinned by Chase Brock of Whitfield in the final. Peyton Tucker (152) saved his season with a second-period fall and 4-0 decision, then dropped his third-place match. Whitfield distanced itself from runner-up Brentwood 267-141 for another team crown.